As a public defender, a young lawyer fresh out of school learns how the legal system really works. Television makes it look so easy. A smartly dressed lawyer comes up with a clever ploy or finds a key witness at the eleventh hour, snatching victory so that justice prevails. In reality, as Farmer’s novel illustrates in occasionally harrowing fashion, the American legal system is a hodgepodge of overworked public defenders, self-righteous judges and endless paperwork in which justice is often a happy accident. Law school lessons still dancing in his head, Paul Fields becomes a public defender in Louisville, Kentucky. He quickly gets disabused of his ivory-tower vision of the law as he descends into Kentucky’s Byzantine legal system and discovers how things actually work. Along the way, he picks up a girlfriend, Megan, who winds up helping him investigate a dandified judge nicknamed Lil’ O and a crooked cop, who are running an illegal scheme from Acme Supply, a dirty company of which the judge is president. Meanwhile, in court, he has to contend with Heath, a smug prosecutor who cares only about advancing his political career. Farmer’s novel is an eye-opening, sometimes-uncomfortable trip through one state’s legal system that will make doubters out of anyone who naïvely thinks justice always triumphs. Farmer, a former public defender and prosecutor, clearly knows his way around the law, and the book rings with authenticity. The story moves along briskly, occasionally becoming too technical as Farmer lays on the legalese. He keeps the Lil’O case percolating on the back burner even as Fields becomes involved with other matters. Until he learns that “things are what they are” and that he can’t change them, Fields flounders at his job. 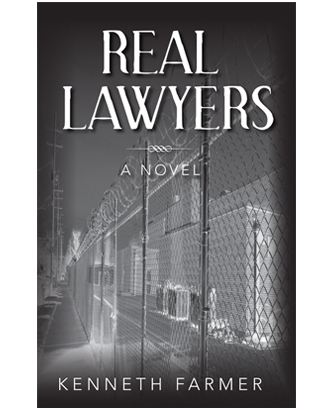 The title of Kenneth Farmer’s debut novel, Real Lawyers, refers to a timeworn jailhouse insult: that public defenders, unlike their private bar counterparts, are not “real lawyers.” While anyone who has practiced criminal law knows the absurdity of this myth, it persists from generation to generation in jails across America. Farmer recently retired from the Dane County District Attorney’s Office. (The reviewer and the author worked together there from 2007 to 2011.) Before becoming a prosecutor, Farmer worked as a public defender in Louisville, Ky. Real Lawyers draws on that experience. Set in Louisville in 1985 and 1986, it chronicles a year in the life of Paul Fields, a newly minted lawyer from Minnesota who takes a job as a public defender in Louisville. Readers of Real Lawyers should get an ethics CLE credit, as the book covers a wide range of ethics issues. Substance abuse, attorney burnout, what must be disclosed in discovery, an elderly judge suffering from episodes of dementia, and a “hallway lawyer” who earns a living by quickly settling all his cases with unfavorable plea deals are just some of the dilemmas presented. This question may not be difficult for most attorneys, who already know about the Gideon right to appointed counsel for indigent defendants, the presumption of innocence, and the reasonable-doubt standard. But the novel suggests that the legal profession could do a better job of explaining these principles to the general public, if only to better respond to needling from future in-laws.